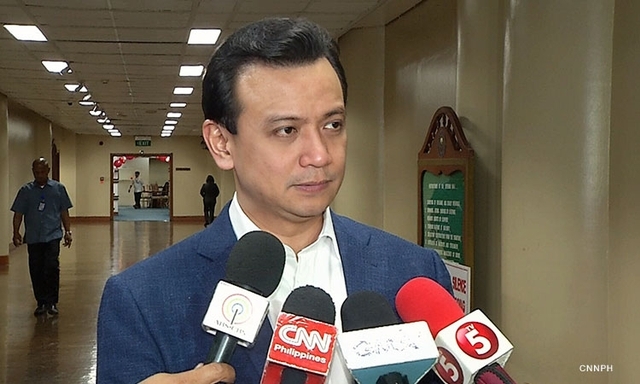 Metro Manila (CNN Philippines, September 13) — After holing up at the Senate for more than a week, Senator Antonio Trillanes IV on Thursday said he'll try to leave. "Ako susubukan ko mamaya na lumabas titingnan natin (I will try to leave later so we'll see)," Trillanes said in a press briefing. "We'll try to do it quietly para (so) we'll see how it goes." He said it would be "an open defiance" of the Supreme Court ruling if authorities arrest him without a warrant from a civilian court. The Supreme Court has left it to the discretion of the Makati Regional Trial Court (RTC) if it would issue an alias warrant against Trillanes after President Rodrigo Duterte issued a proclamation voiding the amnesty granted to the soldier-turned-lawmaker in 2011. Branch 148 of the Makati RTC on Thursday deferred its decision on the matter and instead gave Trillanes 10 days to comment on the petition filed by the Justice Department for a warrant and hold departure order against him. Meanwhile, Branch 150 is set to hear a similar request on Friday. Trillanes said the delayed issuance of an arrest warrant against him proves flaws in the motions filed by the prosecution and the judicial independence of the courts. Trillanes has been staying at the Senate since September 4 when President Rodrigo Duterte's Proclamation 572 was published in newspapers. This order declares Trillanes' amnesty void from the beginning and ordered the senator's arrest. Trillanes was advised by the Senate leadership and his lawyers to stay within Senate premises to avoid any possible arrest. Malacañang on September 7 said there will be no military arrest for Trillanes, as the President defers to the civilian court's decision. The military also gave its word that it will not arrest Trillanes without a warrant from the court. Duterte's controversial proclamation states that the administration of former President Benigno Aquino III erred in granting Trillanes' amnesty since the senator failed to comply with the requirements including filing an application and admitting guilt. Trillanes debunked Malacañang's claims, presenting videos and documents showing he applied for amnesty and admitted guilt. Trillanes, a former naval officer, was involved in three coup attempts against former President Gloria Macapagal Arroyo: the so-called Oakwood mutiny in July 2003, the Marines stand-off in February 2006, and the Manila Peninsula incident in 2007. He and fellow Magdalo soldiers were jailed but freed after receiving amnesty in 2011. CNN Philippines' Cecille Lardizabal contributed to this report.